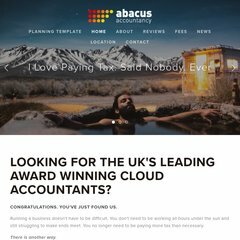 www.Abacus-accountancy.com - Paying too much tax? Topics: Referral Scheme, Other Services, Xero Software, Starting Out, Sole Tradership, and Partnership. Its 2 nameservers are ns11.net-hosted.com, and ns12.net-hosted.com. The programming language environment is PHP/5.2.17. PING (94.76.198.168) 56(84) bytes of data.